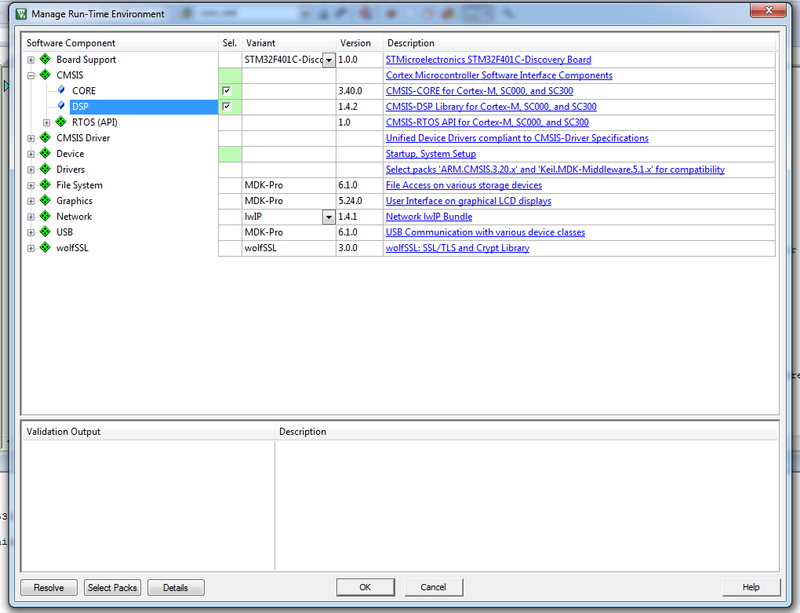 As you maybe know, STM32F4 is Cortex M4 with DSP instructions. This allows you to make a FFT with a few simple steps. 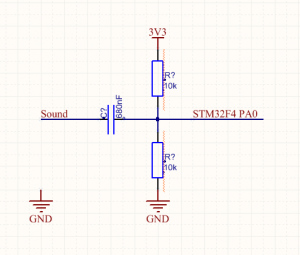 For that purpose, I have made an example, on how to create FFT with STM32F4. I recommend use my FFT library for future use. It is built on ARM DSP library with everything included for beginner. When the ARM company issued Cortex-M4 core, it also published DSP libraries for mathematics and other stuff. And there are also FFT functions. When you’ve downloaded ST’s standard peripheral drivers, you also downloaded CMSIS (Cortex Microcontroller Software Interface Standard), which are designed for all Cortex-M4 processors from every company. Note: Tutorial below for Keil DSP does not work anymore with my project. For that purpose I’ve update my project and include all DSP libraries inside. All other libraries are also included in project. CMSIS libraries are also included in Keil uVision (5 and newest), you just need to enable them. Under “Manager Run-Time Environment” -> CMSIS select DSP. DSP or Digital Signal Processing is a library for “high mathematics” instructions, which are supported by Cortex-M4 with floating point unit. Very fast about FFT. FFT or Fast Fourier Transform is an algorithm to convert time based signal into frequency domain. In other words, you are able to know from which sinus components is some signal created. Everything about FFT is described on Wikipedia. Let’s explain things that we will need here. Example on the bottom is a simple FFT audio equlizer. It will show frequencies in your audio that you will connect to pin. Sound is sampled with 44.1kHz. We will also sampled our signal with about (~) 44.1kHz. To get proper frequency from signal, we need at least 2 samples from one period of highest frequency we want to detect. For our purpose, if we sample with 44.1kHz, then largest frequency you can sample correct is 22050Hz. One parameter in FFT result is resolution, how good you can detect different frequencies. This depends on how many samples you take before you calculate FFT. In example below, I will take 256 samples for FFT calculating, but only 128 samples will be valid to display them. In our case, we have ~45450Hz sampling frequency and if we take 256 samples, we get resolution of 45450 / 256 = 177.5 Hz. What does it say to us? We will get back an array, basically 256 length, but results from 0 – 127 are valid, results from 128 – 255 are the same results as first one, but in reverse order. You always have to take number of samples which are power of 2! Example below works on STM32F429-Discovery board. This board has LCD on it, so it can be also a little bit graphical. 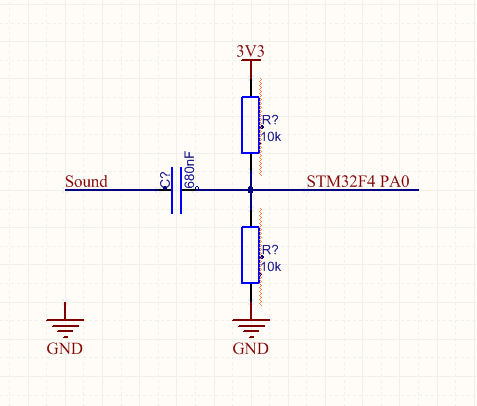 On pin PA5 is an output sinus signal of 10kHz. ADC is not driven with DMA, it’s with “delay” mode. It’s good to show you principle on FFT. 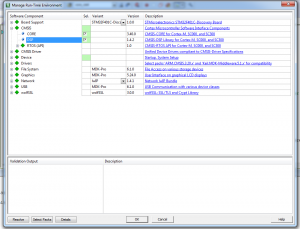 * Keil project example for FFT on STM32F4 device. If you have any problems with compiling project, I’ve added compiled “FFT.hex” file to project. Download entire project with libraries and hex file below. FFT sample project for STM32F429-Discovery board using LCD to display bars.